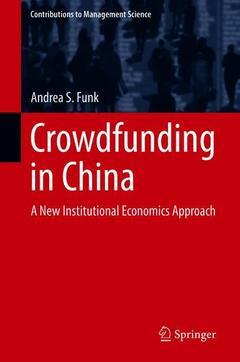 Crowdfunding in China Funk Andrea S.
Add to cart the livre of Funk Andrea S.
China is currently the front-runner on the global crowdfunding market, even though this form of financing originated in the USA. Crowdfunding in China, however, differs significantly from its counterpart in the West. This book reveals that Chinese crowdfunding is a product of the country?s dynamic internet sector, which is based on mobile internet, e-commerce, and online/mobile payments, together with significant government support. The author presents a comprehensive theoretical, empirical and field-based work on crowdfunding in China. Adopting a new institutional economics approach, it maps and deciphers the origins and paths of informal finance that have led to internet finance and the rise of crowdfunding platforms. In addition, three case studies are analyzed and their implications for crowdfunding stakeholders in China are discussed. The Matter of Crowdfunding in China.- Crowdfunding in the Context of New Institutional Economics.- The Concept of Crowdfunding in the West Versus in China.- From Informal Finance to Internet Finance in China.- Crowdfunding in China.- Traditional Informal Finance Versus Crowdfunding in China.- Learnings from Crowdfunding in China. Andrea S. Funk is an Economist and Sinologist by profession, and a founder and entrepreneur by passion. She received her doctorate from the faculty of China Business and Economics at the University of Würzburg (Germany). She has previously contributed to the book "Crowdfunding in Europe" (Springer, 2016), apart from her other publications.